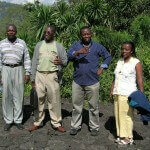 Rwanda is the country where the work for the Empowerment Foundation started. After the war of 1994 the poverty in Rwanda is everywhere increased. Single women, usually widows, suddenly became the sole providers of there family and many times also for the surviving relatives. The good news is that things have improved in 2012. The projects are now independent from our support. Our first project was a restaurant in Kigale, managed by a group of war widows. In the city center a restaurant was started where the women found a new existence. Products are used from women farmers from the surrounding community. 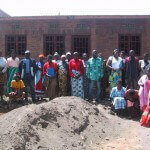 This project became an example fot a similar project in Malawi. The sewing atelier in Ruhengeri, on the foothills of the vulcano’s in Rwanda, is an initiative of three women and is supported by the development agency of the diocese. The goal is predominantly the education of young women and girls (and a few boys) to become professional workers. Until now 150 people have been educated. The participants are able to make their own clothes but also to produce for the market. Next to educating new and older memebers, the co-operation is involved in the production of larger quantities, like school uniforms. To do this the co-operation has with support of the Empowerment Foundation acwuired a number of specialized machines in 2007. They have been operating independently since 2008. Aids is taboo in Africa. People die of pneumonia, kidney disease, but Aids as a cause is never mentioned. The stigma on this disease makes it even more difficult for HIV infected and aids-patients to come up for themselves. In the co-operatie “la Misericorde Divine”, the local foundation for women with HIV with help from the local diocese are empowering themselves. This was all realized in the first half year of 2007. With support from the Empowerment Foundation gardens were created, chicken were bought and a classroom was built in which the groups can meet and where training is given. Thanks to this project the group is slowly getting out of their isolation and started to support each other. The co-operation is also taking care of better distribution of medicines. The success of the first co-operation led to the start of a second group in Ruhengeri. They are bundled in the Ubuzima Bwiza (= good health) co-operation. This group starten trading goats. The Empowerment Foundation has supported in acquiring animals and the building of a stable. Added to the project was a micro credit fund. The Twitezimbere co-operation produces bricks in the Kanyonyomba Valley. These bricks are produces using wood from the surrounding hills. Because of deforestation and erosion that use is now forbidden. 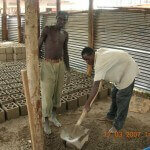 For that reason the co-operation started making concrete blocks for construction. 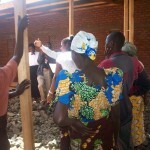 To do this the Empowerment Foundation made three mobile hangars to aid production. The Empowerment Foundation also trained the workers to transfer knowledge for the technology to a 20 people workforce. The co-operation is at this stage profitable.